Listen. I know you're busy. I'm busy too. This entire week has been full of meetings, work and running around. But there's something going on in the world that's begging us to add a to-do to our list. Super Typhoon Haiyan hit the Philippines this past Friday and 1.7 million children are believed to be living in areas in the typhoon's path. One organization that cares specifically about that is Compassion. If you don't know them, Compassion is a child-development organization with programs all over the world, including the Philippines. We have many friends at Compassion Canada and as a company, we sponsor a number of children through Compassion. Also, many of the people here have at least one child that they sponsor and correspond with through Compassion personally. So when the call came last night for bloggers to post about the disaster, it was a no-brainer for us. 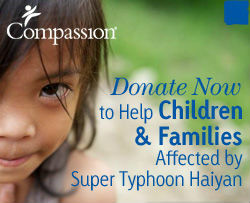 Today, we want to ask you if you'd add a to-do to your list and donate towards Compassion's efforts in disaster relief for the Philippines. Given that our readership includes both Canadian and American readers, we're going to provide two different links below for you to visit and donate through. Worth noting for all you Canadian readers, is that from now until December 9, for every dollar donated to Compassion’s relief and recovery efforts in the Philippines, the government will set aside one dollar for the Typhoon Haiyan Relief Fund. Take the time; Donate the funds; and quite literally, save a child's life.